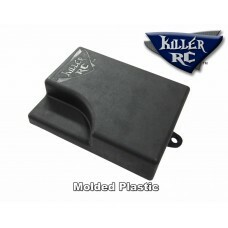 The Killer RC taller battery box lid for the HPI Baja (and clones) holds 3x the volume of the factory lid. This taller lid is solid, with no holes, which keeps your radio box cleaner and dryer. You can easily drill holes in the sides or top to add lights, power switch, plugs, or whatever you want. over the top of this taller battery box lid. If your Baja has a Team Chase or Kraken cage you only need the lid.